Michael Hussey scored a powerful century and Shane Watson a belligerent 72 as Australia piled up 361 for eight in the third and final One-Day International against Bangladesh in Dhaka. Australia's experienced batting line-up continues to give the Bangladesh bowling attack a torrid time and they are firm favourites to clinch a series clean sweep, going into the match with a 2-0 series lead. Watson, opening the batting with Ricky Ponting (47), needed just 25 balls to reach his half-century, going on to face 40 deliveries in all, hitting 11 fours and five sixes. He was frustrated at times by Bangladesh, but they were unable to prevent him scoring heavily on the on-side. His innings was ended when he missed one from left-arm spinner Abdur Razzak, who also had Ponting trapped in front. Michael Clarke also scored 47 and was, like Ponting, bowled, this time by Mashrafe Mortaza but Hussey ensured that Bangladesh were not able to bowl themselves back into contention. 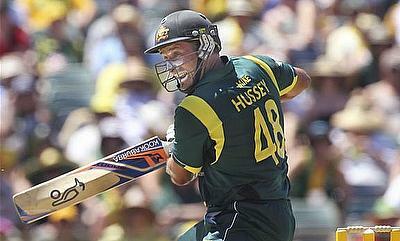 He faced 91 balls, hitting nine fours and two sixes as Australia proved that the third Power Play does not have to be left until the final five overs of the match, instead taking it with 15 overs to spare and HUssey profited from the move despite the cheap dismissals of Callum Ferguson (3) and Tim Paine (7). Fellow left-hander Mitchell Johnson carved a quickfire 41 in 24 balls to further assert Australia's dominance and in a similar vein, John Hastings hammered 21 not out in nine balls with three fours and a six as Australia posted their fourth-highest ODI total of all time. Mortaza and Razzaq toiled away to return three for 80 and three for 58 respectively.